"August is shaping up to be an exciting month for fans of Chinese street food," says New York Magazine and gosh, I think they might be right, with two newly-opened purveyors of cheap tasty treats opening in recent weeks: Province in Tribeca (Church & Walker) serves meat-filled mantous for $3.50-$3.75, and Roll and Dough in the West Village (West 3rd near 6th Ave) is the Manhattan outpost of Elizabeth Ting, the lady known to Chowhounders as the Flushing Bing lady for her delicious bings, flat packages of sesame-seed encrusted dough with all sorts of delicious things inside. Lots of photos here, taken by The Girl Who Ate Everything. Look, ma—now we do videos too! Hope you all like this one, there should be more coming soon. We hope to put two or so up every week. Thanks so much to Mo SantRam for the great editing advice! The first time I ever tasted the sweet, sweet nectar of soup dumplings was at the Chelsea branch of Grand Sichuan, three or more years ago with Alaina. Grand Sichuan St Mark's has been open for over a year now and while I was slightly disappointed with them during their first few months, I'm happy to report that the food has gotten better and better every time I've visited. In fact, after my most recent meal there this past week, I can finally say that Grand Sichuan St Mark's has now replaced New Green Bo as my number one Chinese spot—the only way I could love it more is if the Chinatown Ice Cream Factory opened up a branch on St Mark's too! Soup dumplings aside, my current favorite items on the menu are the Sichuan Wontons in red oil, the Sichuan Dan Dan noodles, and the cold cucumber in scallion sauce. Thank you to Donny for making me try the latter dish despite my anti-cucumber bias, it's so delicious and refreshing that I now order them with every meal, and so should you. 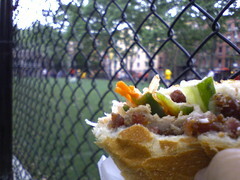 Buy a pork banh mi sandwich on Mulberry and a taro slush bubble tea on Grand, then enjoy your delicious treats while watching a futbol match on Chrystie. I love New York. Robert Sietsema reviews Super Taste hand-pulled noodles, on Eldridge. Recommended by Sietsema, after the place was recommended to him by Calvin Trillin? You know I am so eating there sometime in the next week, right? Hand-pulled noodles with beef + pork dumplings, bring it on. eGullet conversation with Ruth Reichl on Chinese food on NYC (emphasis mine): "Which is all a long way of saying that after living in California, it's hard to get very excited about Chinese food in New York. We just don't have the kind of monied, sophisticated Chinese eaters who support great restaurants." Snow pea shoots or dou miao are in season now until early spring. I've seen them recently at San Francisco's Chinatown markets, but didn't buy any because I didn't know how to prepare them myself. A quick search this morning and I found EatingAsia's recipe for Hot and Spicy Noodles with Pea Shoots, and another recipe for a simple garlic stir-fry (scroll down to the second recipe on the page). 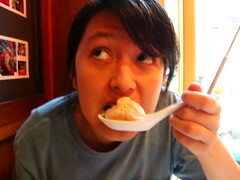 Eating China is a new-to-me website and blog about Chinese food culture and history. Despite my love of other fermented foods (kimchi!) and beverages (beer! ), the godawful stink of stinky tofu is still in the way of a real love affair between me and this unique dish. NYC Nip and Squirt. A Full Belly patron saint Robert Sietsema reviews Mott Street's two-year-old Shanghai Café: "The most expensive ($6.95 for 8) features pork and a larger wad of crab than has ever been found in a juicy bun before. Sans crab, the dumplings are two dollars less, and I don't know which to recommend, since each is equally good in its own way. A third type cloaks gravy and pork in a doughier dumpling, fried crisp on the bottom like a pot sticker. The squirting grease will still kill you." Sounds like my kind of place! When I'm in Chinatown I almost always eat at New Green Bo, but I'll give Shanghai Café a shot next week.